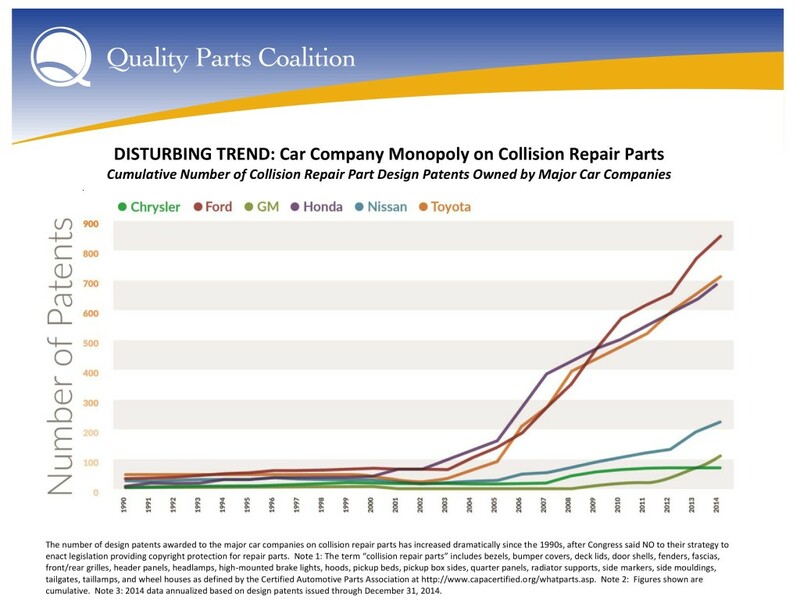 Claiming that automakers are overpatenting vehicle part designs to drive out cheaper copies and keep prices high, the Quality Parts Coalition has launched a campaign in support of the PARTS Act, which would allow aftermarket copies of individual components sooner. QPC Executive Director Ed Salamy said the OEMs are also abusing the patent system by patenting the overall look of a car but the individual design elements as well. “They’re essentially double-dipping,” he said. PARTS Act bills were introduced in February by U.S. Sens Orrin Hatch, R-Utah; Sheldon Whitehouse, D-R.I.; U.S. Reps Darrell Issa, R-Calif.; and Zoe Lofgren, D-Calif. The QPC kicked off its publicity push in support Tuesday. Under the bill, original automotive OEMs — and no one else — would lose design patent protections after 30 months. Right now, any design patents issued by the government are good for 14-15 years. Design patents are different from what one would consider a traditional “invention” patent (known as a “utility” patent). They’re purely aesthetic — there’s no function at all. It’s the difference between patenting a funky triangle-heavy grille (design) and patenting one meant to protect a pedestrian (utility). The number of design patents issued to Ford, Toyota and Honda started to skyrocket around 2000-03, with Nissan starting to do the same but on a smaller scale around 2005. There are indications GM started on an upward trajectory too around 2011 (remember, it had other things on its mind during the recession), based on the QPC’s data. And the OEMs have become “real agressive” about using them to combat aftermarket copies, according to Salamy. “That’s not something they had done before,” he said. Salamy couldn’t point to a reason for the change in policy. “I wish I knew the answer to that specifically,” he said, but estimated the tactic originated with Ford in 2005. Aftermarket parts haven’t been really dwindling as a proportion of repair bills or total parts installed, based on Mitchell data. But Salamy attributed that OEMs haven’t been enforcing the patents (which haven’t been in play that long) until recently. “You’ll start to see those (aftermarket) numbers go back,” he said. We contacted the U.S. Patent Trademark Office about the about the QPC’s “double-dipping” complaint but were told it doesn’t comment on pending legislation. A spokesman referred us to this guide for a question about the design patent process’ rigor. 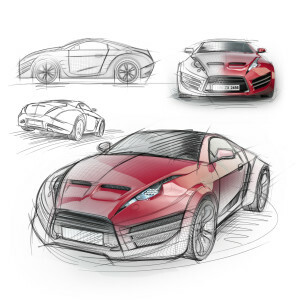 Also asked about “double-dipping,” Dan Gage, director of communications and public affairs for the Alliance of Automotive Manufacturers, argued for the merit of design patents. But individual components had their own aesthetics as well, he said. However, the PARTS Act merely singles out automotive OEMs. No other manufacturers would be affected — including aftermarket companies. So a parts manufacturer or SEMA modder shop can patent the look of a tricked-out substitute grille for more than a decade, but an automaker gets less than three years of protection on a new style of OEM grille. Salamy said it wasn’t necessary for non-OEMs. The OEMs indicated to lawmakers they’re actually OK with aftermarket manufacturers who don’t copy a part outright. A design for an article of manufacture that is dictated primarily by the function of the article lacks ornamentality and is not proper statutory subject matter under 35 U.S.C. 171. Specifically, if at the time the design was created, there was no unique or distinctive shape or appearance to the article not dictated by the function that it performs, the design lacks ornamentality and is not proper subject matter. So for automakers to claim that infringing on a patent on the appearance of an object compromises its function is sort of wrong from a federal patent sense, even if accurate from a practical sense. Their stance in favor of aftermarket parts which look different, meanwhile, sounds correct from a federal patent perspective, but damages their imitation-parts-aren’t-as-safe argument. But on a practical sense, their argument and the QPC rebuttal are worth careful consideration by consumers and lawmakers. The debut of sensors, cameras and more advanced materials — not to mention seemingly cosmetic parts designed with a safety issue in mind (such as our grille example above) — in cars means that slight differences in aftermarket parts — even those which replicate the new technology — theoretically have a greater potential of throwing off a broader system. Calibration experts noted at SEMA that tiny changes to a showroom-floor, all-OEM car — even aftermarket tires — could throw off sensors and require recalibration. OEMs and collision repairers have argued with aftermarket manufacturers about how well aftermarket bumper beams and other components protect occupants or affect airbag timing. “A tenth of an inch is an awful lot,” Gage said of performance differences between OEM and non-OEM parts. Non-OEM parts technically don’t have to notify the feds about recall inquiries, and Takata was a rare example of the NHTSA going after someone other than an automaker with a recall, the National Highway and Traffic Safety Administration told us earlier this year. Plus, the law doesn’t allow only certified aftermarket parts — which according to the NSF and CAPA still don’t undergo all the IIHS crash tests of an OEM part — to copy OEM parts after 30 months. It lets any part manufacturer, regardless of certification, do that. And there’s a lot of junk out there, as CAPA itself will tell you. The QPC does cite the IIHS’ 2010 conclusion that cosmetic aftermarket parts “serve no safety or structural function,” which drew upon research from a decade earlier. But 2000 is eons ago in car technology years, and perhaps it’s time to reconsider it and what impact aftermarket cosmetic parts have on the new sensor technologies and overall weight of the vehicle. The IIHS also warned in the same article that aftermarket bumper beams aren’t cosmetic, and non-CAPA aftermarket ones weren’t performing as well as CAPA ones. It urged consumers to be wary of non-CAPA aftermarket beams. Even then, we’d wonder how well the CAPA bumper standard held up if the IIHS were to crash-test every vehicle, not just one or two 2008 Dodge Ram 1500s. We know how well OEM bumpers and bumper covers do or don’t work; we can see the IIHS findings.